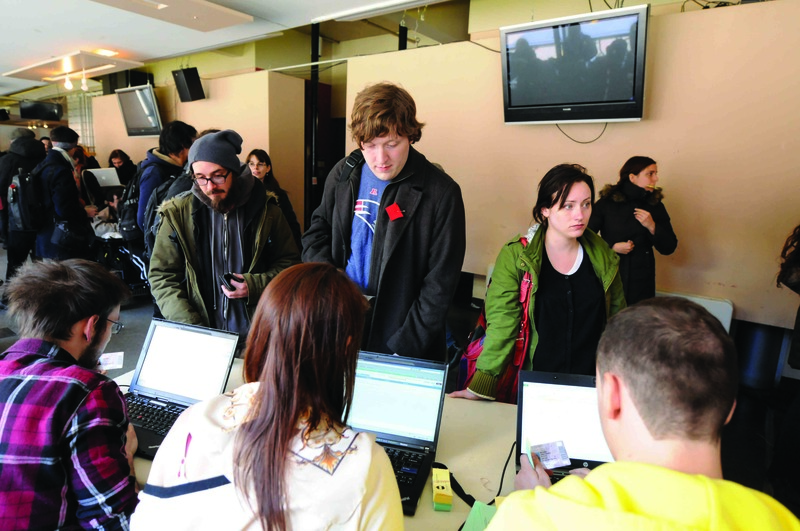 Unlike its March 7 predecessor, the second general assembly held on Monday by the Concordia Student Union to vote on continuing the strike was met with little success. While about 2,000 students were present at the first GA, less than 300 showed up on the Reggie’s terrace for the outdoor GA organized by the CSU. After more than an hour of waiting in the cold and windy afternoon, the CSU still had not met the minimum of 450 registrations in order to carry out the vote. Around 3:30 p.m., CSU Chair Nick Cuillerier announced only 12 students had registered in the past hour and declared the GA adjourned. Shortly after the GA, about 100 students organized a sit-in on the 7th floor of the Hall building and started passing around a new petition to call for a third GA. While undergraduates as a whole are no longer on strike, individual faculty departments are still holding strike GAs and are organizing mobilization movements on their own. Yesterday’s adjournment struck some motions off the agenda specifically for that GA. Notably, the motion to pass the minimum agreement, which would prevent the CSU from denouncing the actions of other student associations, as well as requiring that all student associations be present when negotiating with the government. Walcott said he was confident the movement was not losing momentum. Some students, including those who organized the petition for this second GA, blamed the CSU for the failure to meet quorum, emphasizing a lack of organization and advertising. Several students also said that the GA would have attracted more students if it was held indoors. The CSU said it was forced to hold it on the Reggie’s terrace because of a double-booking of the Hall auditorium. The sit-in of the CSU lounge that came after the GA was a direct reaction to a recent email from the administration warning picketers that they could face formal charges. The original plan to occupy the GM building was cancelled when a student reminded the group that such action could not be carried out without a plan. Instead, the 100 students headed for the 7th floor of the Hall building to prepare an agenda for Concordia’s future actions in the movement against tuition hikes. Just like the provincial student associations, Concordia students talked about a radicalization of the movement, notably by increasing the number of acts of disturbance.